Grand River Tech Paramedics is officially the first Accredited Paramedic program in North Missouri! The GRTS Paramedic Program is accredited by the Commission on Accreditation of Allied Health Education Programs upon the recommendation of CoAEMSP - the Committee on Accreditation of Educational Programs for the Emergency Medical Services Profession. Lives are saved every day due to the quick reaction and competent care of emergency medical technicians (EMTs) and Paramedics - EMTs with additional advance training to perform more difficult pre-hospital medical procedures. Missouri EMS personnel respond to over 1/2 million calls annually for incidents as varied as heart attacks, auto accidents, drownings, childbirth, gunshot wounds, etc. all requiring immediate medical attention. During the 1950s, the need for quality pre-hospital care of the critically ill and injured was recognized and, as a result, standardized levels of emergency medical education and pre-hospital health care delivery were developed through the United States Department of Transportation. The minimum level - First Responders - are trained to provide basic emergency medical care because they are usually the first persons to arrive on the scene of an accident. Many firefighters, police officers, and other emergency workers have this level of training. The EMT-Basic rescue personnel are trained to care for patients on accident scenes and in transport by ambulance to the hospital under medical direction. The EMT has the emergency skills to assess a patient's condition and manager respiratory, cardiac, and trauma emergencies. The EMT-Paramedic provides the most extensive pre-hospital care, which includes administration of intravenous fluids and use of manual defibrillators to give lifesaving shocks to a stopped heart. The paramedic will utilize advanced airway techniques and equipment to assist patients experiencing respiratory emergencies. Paramedics may also administer drugs orally and intravenously, interpret EKGs, perform endotrachael intubations, and use monitors and other complex equipment. Clinical experience in hospital or emergency services department. Upon successful completion of the course, the student is then eligible to sit for the National Registry of Emergency Medical Technicians examination for the EMT-Basic. Once this examination is successfully completed, the student may then apply for Missouri licensure as an Emergency medical Technician-Basic. The EMT-Paramedic program is available to prospective students as either a certificate program or students may pursue an Associate of Applied Science Degree. The Associate Degree program includes all of the courses required for Missouri EMT-Paramedic certification as well as a general studies curriculum. The EMT-Paramedic class meets two days per week plus clinical hours and is approximately 15 months in length. The core EMT-Paramedic program consists of the following... click here for Paramedic Syllabus. Corequisite - *Anatomy & Physiology for college credit may be taken prior to or concurrently with the GRTS Paramedic course, but it MUST be taken. *A course completion will only be issued upon receipt of official transcript from the college in which the A&P was taken. The transcript must show successful completion of A&P with a minimum of a 2.0 GPA required. Upon successful completion of the course, the student is then eligible to sit for the National Registry of Emergency Medical Technicians examination for the EMT-Paramedic. 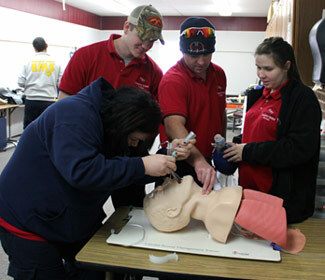 Once this exam is successfully completed, the student may then apply for Missouri licensure as and EMT-Paramedic. Plus, 98% 3-year average placement! Employment of emergency medical technicians and paramedics is expected to grow faster than the average for all occupations through 2012. Population growth and urbanization will increase the demand for full-time paid EMTs and paramedics rather than for volunteers. In addition, a large segment of the population�the aging baby boomers�will further spur demand for EMT services as they become more likely to have medical emergencies. There will still be demand for part-time, volunteer EMTs and paramedics in rural areas and smaller metropolitan areas. In addition to those arising from job growth, openings will occur because of replacement needs; some workers leave the occupation because of stressful working conditions, limited potential for advancement, and the modest pay and benefits in private-sector jobs. Paramedics, licensed in the State of Missouri, will receive advanced placement into the AAS degree in EMT-Paramedic. Thirty college hours will be awarded for completion of the paramedic program, which is applied to the associate degree program. NCMC provides two degree options: Management and Allied Health. The Firefighter Program is a separate program also offered through GRTS.